It hardly needs to be pointed out that memory is essential not just to what we are, but to our very survival. The “present” we inhabit is really a collection of memories, some from the last milliseconds (what we see as “present’), filled out by and compared to memories of similar past experiences. It really is the “remembered present”.1Edelman (2006). Neural circuits, the basis of what goes on in the brain such as learning or plasticity, are set up by modification of synaptic strengths.2I see it as the enhanced synapses’ having less resistance to passage of electrochemical neuronal circuits, so that signals take the path of least resistance from one neuron to another. Physicists like minimizing paths. Studies of the giant sea slug, Aplysia, have demonstrated mechanisms for implicit learning.3All the discussion of Aplysia is based on Kandel (2006). A simple stimulus, a puff of air on a part of the animal called a siphon, causes a reflexive retraction of the gill. This is called the gill-withdrawal reflex. After a series of gentle puffs, the animal becomes habituated and no longer retracts the gill as much. Molecular study of habituation has found it to be due to the pre-synaptic terminal, specifically to the production of less Ca++ and therefore reduced release of the neurotransmitter, glutamate, by the synaptic vesicles. Exactly how this happens is not yet known. Nevertheless, the animal has learned that the gentle puff is not worth getting excited over. The effect is short-term, it disappears after a while. This process also has been understood in detail on the molecular level. In sensitization, the axon of the sensitizing or modulating neuron from the tail makes synapses on the cell body and especially on the pre-synaptic axon terminal of the sensory neuron from the siphon at its synapse with the motor neuron to the gill. (So synapses are not always formed between an axon and a dendrite.) 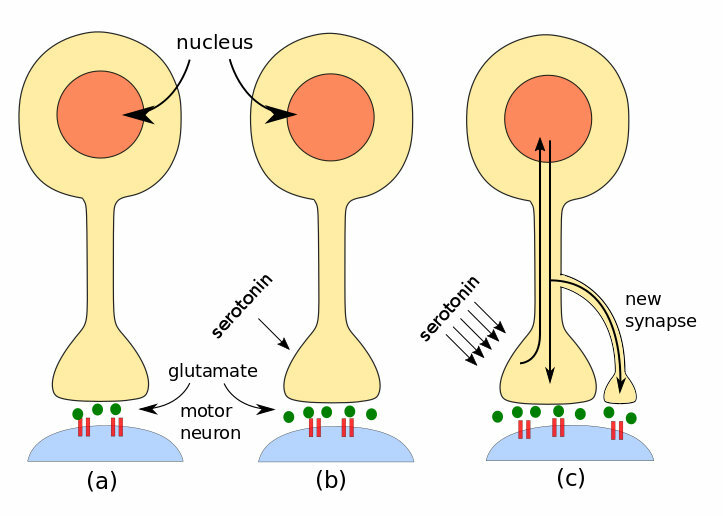 The series of tail shocks causes the modulating neuron to release a different neurotransmitter, serotonin, as a first messenger into the synapse between itself and the pre-synaptic terminal of the sensory neuron. The first messenger activates a metabotropic receptor on the sensory axon terminal and this in turn releases a second messenger inside the axon – our old friend cyclic AMP, or cAMP.4We met cAMP when we looked at how the lac operon works. The cAMP activates an enzyme called protein kinase A, or PKA. A molecule called CPEB7CPEB is cytoplasmic polyadenylation element-binding protein. is found in neurons of Aplysia, Drosophila, mice and humans – and so probably every animal species. It is (or is similar to) a prion, i.e., it exists in two different conformations (shapes). Serotonin causes CPEB to switch from its inactive to its active form. Since the active form is present only in the axon terminal which has been modulated by serotonin, it can serve as a signal to the proteins and mRNA coming from the nucleus which axon terminals they should enhance by making new synapses. Very importantly, CPEB also assures the continuation of local protein synthesis using mRNA from the nucleus, in effect perpetuating the increased synaptic strength. This is long-term implicit learning. Similarly, but surprisingly, if the input arrives when the post-synaptic neuron is weakly activated, the synapse of the pre-synaptic neuron is diminished in strength.8The last two statements correspond to what is referred to as Hebb’s law. Studies of London taxi drivers have shown clearly that the hippocampus is the seat of spatial memory, a type of explicit memory. One way such synaptic strengthening can take place in the hippocampus is through the mechanism of long-term potentiation (LTP), which requires the synchronized firing of NMDA receptors and AMPA receptors on a post-synaptic terminal.9AMPA = α-amino-3-hydroxyl-5-methyl-4-isoxazole proprionate; NMDA = N-methyl-D-aspartate. Although both are glutamate-gated receptors, their function is somewhat different. AMPA receptors allow only Na+ and K+ to cross the cell membrane, whereas NMDA receptors also allow large amounts of Ca++ to enter. Normally, the channel of the NMDA receptor is blocked by the presence of a Mg++ ion, which keeps the passage of Ca++ minimal. Even if NMDA channels are gated by glutamate, they will remain blocked by the Mg++. Only if AMPA channels first adequately depolarize the target cell will the voltage-gated NMDA channels open. A low-frequency action potential in the pre-synaptic terminal releases only moderate amounts of glutamate, so the post-synaptic AMPA receptors allow in moderate amounts of Na+. However, a high-frequency pre-synaptic action potential releases much more glutamate which in turn causes the AMPA receptors to allow in much more Na+. Electrostatic forces due to the resulting increase in positively charged Na+ in the post-synaptic terminal push out the Mg++ from the NMDA receptors, which then allow large amounts of Na+ and, especially, Ca++ to enter the cell.10Why does the electrostatic potential push out Mg++ but allow Na+ to enter? This only happens if there is a significant amount of Na+ inside the cell and if the NMDA receptor has already bound glutamate outside the cell. So opening of the NMDA receptor requires both pre- and post-synaptic events, making it a coincidence detector and acting like an AND gate. One can see how this process can lead to associations in neuronal circuits. Suppose a neuron has synapses from three inputs, say, X, Y and Z. If X fires all alone, it is incapable of depolarizing the post-synaptic cell enough for LTP to occur. The same is true for each of the other two synapses. But if both X and Y fire simultaneously, i.e., repeatedly over the same short time period, their cumulative effect may be strong enough to depolarize the cell sufficiently for LTP to take place, meaning that the X and Y synapses will be strenghtened by the means we have seen. Now, if either X or Y brings an input, the post-synaptic neuron may fire, meaning that X or Y have the same result and are therefore associated. The third synapse, Z, will not have been enhanced.11This excellent example is based on one given by Bear et al. The projections from the neocortex sensory areas to the LPC work in both directions. The LPC sends signals back to the cortex, bringing about activation of neurons similar to those evoked by the original image (sight + feel + sound). But this time, rather than originating in the sense organs, the signals are coming directly from the LPC. In this way, the LPC causes the set of neuron activations (the image) to remain in the neocortex longer than it might have done otherwise. This is working memory, one form of short-term memory. Most people are limited to no more than seven items at a time in working memory.12According to my wife, I am limited to only one – maybe two, if you include breathing. The hippocampus also is connected to virtually the entire neocortex, as well as the LPC. 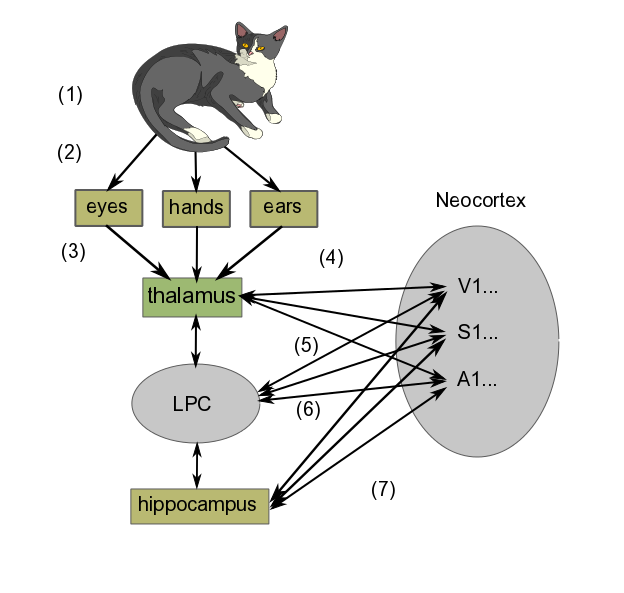 Like the LPC, it can bring about a set of connections in the neocortex (i.e., alteration of synaptic strengths), which is at the core of thinking about the image in question. Repeated thinking like this is called rehearsal. Over time (maybe several days), such rehearsal, which takes place predominantly during REM sleep13Deep sleep in which dreaming is related to Rapid Eye Movement (REM)., leads to a long-term memory of the event, again, in the same part of the sensory cortex where the original sense-data experience was stored. Emotions, on which subject whole books have been written14Such as those of Antonio Damasio..
2. ↑ I see it as the enhanced synapses’ having less resistance to passage of electrochemical neuronal circuits, so that signals take the path of least resistance from one neuron to another. Physicists like minimizing paths. 3. ↑ All the discussion of Aplysia is based on Kandel (2006). 4. ↑ We met cAMP when we looked at how the lac operon works. 6. ↑ Creb is cyclic AMP response element-binding protein. You see why it’s called CREB. 7. ↑ CPEB is cytoplasmic polyadenylation element-binding protein. 8. ↑ The last two statements correspond to what is referred to as Hebb’s law. 9. ↑ AMPA = α-amino-3-hydroxyl-5-methyl-4-isoxazole proprionate; NMDA = N-methyl-D-aspartate. 10. ↑ Why does the electrostatic potential push out Mg++ but allow Na+ to enter? 11. ↑ This excellent example is based on one given by Bear et al. 12. ↑ According to my wife, I am limited to only one – maybe two, if you include breathing. 13. ↑ Deep sleep in which dreaming is related to Rapid Eye Movement (REM). 14. ↑ Such as those of Antonio Damasio. We have already seen how afferent axons from sensory receptors enter the spinal column through the dorsal root and motor neurons exit through the ventral root. The afferent and efferent axons are grouped into spinal nerves before separating to go their separate ways. Once outside the spinal column, these axons and nerves are part of the peripheral nervous system, or PNS. We also have seen how efferent axons connect to muscle fibers via the neuromuscular junction (NMJ) to initiate muscle contraction. So not very much is left to add, unless we go into more detail. the autonomic nervous system (ANS), which is responsible for control, such as the glands, heart and involuntary muscles . reflexive movements, automatic reactions which nevertheless may become conscious. The third type, reflexive movement, is a fast, protective mechanism, which generally occurs before the brain is informed of the situation. Instead of the sensory neurons’ contacting the brain to obtain a command, these signals pass directly to interneurons in the spinal column and from there back out to the muscles, thereby avoiding the delay which would result from contacting the brain to obtain a response. This is of course how the classic knee-jerk reaction works. The interneurons are linked together into networks. The signal may also be passed to the brain to become conscious. The anterior cingulate cortex (ACC) compares plans to how things are really happening in order to correct for errors or trouble due to unforeseen circumstances. It also monitors progress towards goals. It is connected to the lateral prefrontal cortex, giving it access to working memory. We will not look any deeper on the subject of motor control. So let’s go study how learning and memory take place. Hearing depends on ionotropic mechanoreceptors based on selectively depolarizing ion channels. First, sound energy is reflected and directed by the earlobe (pinna) , which can detect some vertical direction and modulates the frequency some as a function thereof. Then the energy passes through the auditory canal of the so-called outer ear, whose sensitivity is subject to resonance at the mid-tones we use to distinguish sounds. 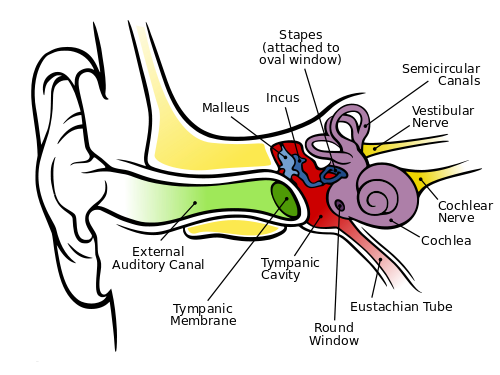 At the end of the canal, the sound wave hits the eardrum (tympanic membrane). This membrane is connected to the trio of tiny bones – the hammer (malleus), anvil (incus) and stirrup (stapes) – which use physical leverage to bring about slighter but stronger movement where the stirrup presses against the entry membrane to the cochlea, the oval window. The cochlea is rather like a nautilus shell, larger at the entry and spiraling somewhat to a smaller end. Its walls are lined with fine hairs which have finer hairs upon them, called cilia. As the cilia are moved by the sound energy, they stretch the hair-cell membrane, causing the stretch-sensitive mechanoreceptors in the membranes to depolarize. The resulting action potential sends information about the frequency and amplitude of the sound along the auditory nerve. The wider entrance of the cochlea detects higher frequencies, the small end, lower, so that frequency is a function of position in the cochlea. Also visible in the figure are the three semicircular canals which constitute the vestibular system. They are oriented so that they can detect rotation and angular acceleration of the head about three axes and, so, in three dimensions. Not shown are the utricle and saccule, otolith organs which detect not only head tilts but the force of gravity. They and the semicircular canals are also lined with cilia and the set of vestibular and auditory cilia on either side of the head is said to constitute a vestibular labyrinth. Nerves from these systems are used by different parts of the brain in conjunction with ocular information and proprioception to detect and maintain the body’s orientation. They also contribute to the vestibulo-ocular reflex (VOR), which enables us to keep our eyes on a subject in spite of head movements. The signals detected by the cilia are sent through other structures and finally arrive in the inferior colliculus of the thalamus on the opposite side of the brain. The thalamus relays the information on to the primary audio cortex, A1, in the superior temporal lobe, on whose surface location is a function of frequency, rather like the skin (somatosensory) map. It is not completely understood what happens after that. It is known though that two areas on the left side of the brain are important. The zone called Wernicke’s area is necessary to the understanding of language. Similarly, Broca’s area is necessary for producing speech. Although these two areas are found on the left side of the brain in most right-handers, the right side also seems to be necessary for the comprehension of prosody (change of tonality and rhythm in speech). So it is only logical that the right side appears to play a role in the appreciation of music. Detection of sound direction, though less good than in the case of vision, is accomplished vertically by the pinna, as already discussed, and horizontally by the difference in arrival time and intensity of the sound in the two ears. Touch, or somatosensory perception, takes place in ionotropic receptors mostly in the dermis, the lower part of the skin. The outer part, or epidermis, is composed of sloughed-off dead cells from the dermis and constitutes a mechanical protection layer. The receptor cells themselves are in the dorsal root ganglion, a concentration of cells just posterior to the spinal cord. Such a cell has no dendrites and only one axon, which bifurcates, one end going to the dermis where its end holds the receptor, one into the spinal column. From there, it connects to interneurons which carry the signal up the spinal column to the thalamus on the opposite side of the brain from the receptors. In addition, the dermis contains free nerve endings with ion-channel receptors sensitive to temperature, extreme force or other possibly dangerous contacts. The ventral posterior nucleus of the thalamus relays the signal to the somatosensory cortex (parietal lobe) just behind the central sulcus, where it is localized on a skin map, as already seen. In the map, the signals from a fairly well-defined part of the skin (such as the face or a hand) are found together. Outputs from the map connect to memories of previous touch-associated events. Cross-talk between adjacent areas of the map may lead to confusion as to the source of a stimulus. The olfactory bulb in the top of the nose canal contains about 10 million olfactory receptors of about 1,000 types. They are metabotropic receptors on the cilia of the bulb. A smell is detected by many receptors and is distinguished by something like a weighted sum of the different results. Olfaction is the only one of our senses whose receptors do not send information to the brain by way of the thalamus. Instead, they project to several sites in the cortex, including the olfactory cortex, which has direct influence on various brain areas. Information also passes via the olfactory tubercle to the thalamus, which transmits it to the orbitofrontal cortex in order to bring about consciousness of the odor. Other parts of the cortex control unconscious or reactive odor detection and memorization of smells. The reason the olfactory receptors bypass the thalamus is evolutionary and is probably due to the fact that our ancestors already had a highly developed sense of smell, much like many animals today. So all that was left was to relay the smell to the thalamus in order to it to become conscious. The receptors also send information to, among others, the amygdala for emotional response (e.g., for spoiled food) and to the hippocampus for memorizing of smells. The surface of the tongue has structures called papillae, in which there are four types of receptors, only three of which are taste buds, containing about 10,000 taste cells. Each cell has several receptors responding to five different basic tastes: sweet, salt, bitter, sour (acid) and umami (meaty). Some are ionotropic, some metabotropic. Signals pass from the receptors through another structure, the nucleus of the solitary tract (NST), to the thalamus either as pure basic tastes or mixtures. The thalamus relays it to the cortex for consciousness of the taste. Connections with the amygdala allow recognition of tastes associated with bad experiences in the past and so to be avoided. The NST, which influences the ANS, also receives input which may signal that you have eaten enough of that taste. We distinguish different tastes far less well than different smells. Taste information is joined with olfactory information in the orbitofrontal cortex to generate flavor. Flavor therefore suffers if, for instance, our olfactory mucus is affected by a head cold. Now, onward to brain output to the motor system. Since adjacent areas of the map do not always correspond to adjacent organs, leakage or “cross-talk” between the areas may lead to confusion of senses, as in the case of synesthesia, in which a person may see numbers or hear musical tones as possessing colors.1Could they also be the basis of metaphor? The number of receptors on the retina, on the order of 100 million, is far too great and sends information too fast for it all to be sent to the brain, especially as there are only around a million axons leading to the brain. So, in between light reception by the photoreceptors and output from ganglion cells to the brain, some information processing takes place within the retina.2This can be likened to the Control Data Corporation supercomputers of the 70s (which I knew well), which had one central processor for mathematical and logical calculation, and a number (on the order of 10) of smaller, independent so-called peripheral processor units which handled input-output and storage devices. The logic behind these names is that the OFF cells depolarize when light is off (more glutamate); the ON cells, when light is on (less glutamate).3Such logic can only be described by the French word tordu, twisted. Anyway, you don’t have to remember this. If you insist, though, it goes like this: Light on means the receptor emits less glutamate, which hyperpolarizes (turns off) the OFF cells and depolarizes (turns on) the ON cells. Light off means the receptor emits more glutamate which which depolarizes (turns on) OFF cells but hyperpolarizes (turns off) ON cells. Sheesh. The important point is that there are two types of bipolar cells with opposite reactions to a given input. A similar mechanism is used in some color-detection ganglion cells. For instance, an R+G– type ganglion cell has a red-sensitive center field and a green sensitive surround field, so that green around red inhibits signaling of the red. So white light, which contains all wavelengths, would cause the two fields to cancel out.4I find the functioning of retinal cells is as genial as some of the other marvels of the scientific world, like the electron transport chain. Each retinal photoreceptor, rod or cone, is composed of an outer segment (farthest from the lens, in other words, at the back), an inner segment, a cell body and a synaptic terminal, which connects to bipolar and horizontal cells. In rods, light reception takes place in a column of disks which are stacked parallel to each other. Light is detected in the disks by receptor proteins called opsins (such as rhodopsin in the cones). An opsin is like a metabotropic channel in the disk membrane, but its receptor is blocked by an agonist5A substance which binds to a receptor. called retinal, which is a derivative of vitamin A.6Hence, the importance of vitamin A for vision. When EM radiation (light) is absorbed by the retinal, it changes the conformation (shape) of some of the bonds from cis to trans, and this changes its shape and color (so the process is called bleaching). This triggers the series of processes leading to closing of Na+ channels and hyperpolarization of the cell. So it is generally accepted that photocells in vertebrates and invertebrates evolved from a common ancestor.7Lane (2010), 199. Somewhere along the line, this cell was duplicated, one type to become eyes, the other, circadian detectors. 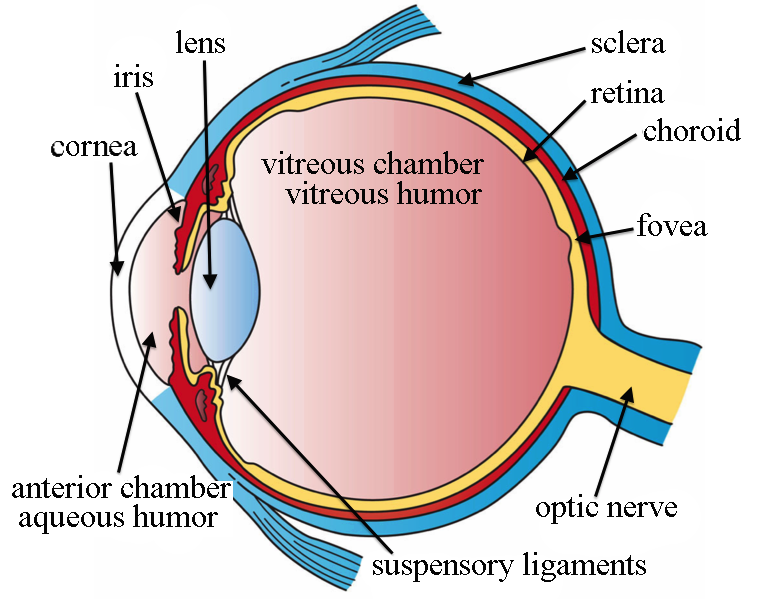 The eye was originally an area of light-sensitive cells on the surface of the skin. Then epithelial folding moved the cells into a cavity, lenses formed, and so forth, on up to animal eyes today. 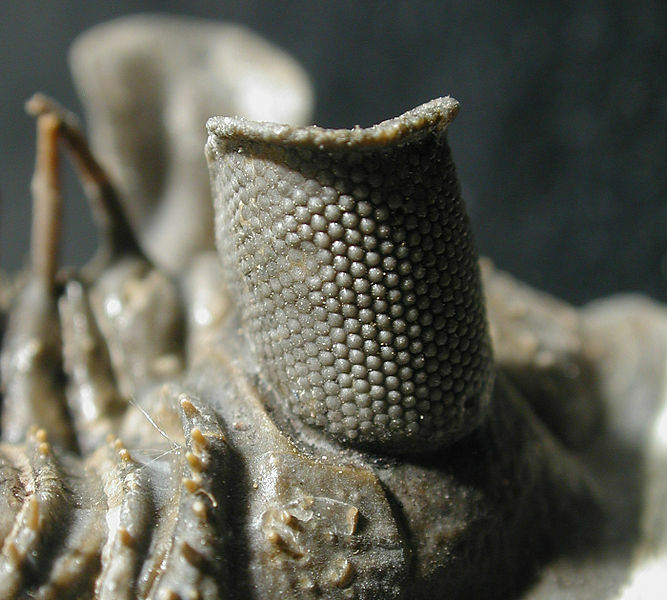 The first animals to have image-forming lenses (and there were a lot of them, lenses and animals) were probably trilobites, whose eyes came to be composed of multiple oriented calcite lenses. These eyes date from 540 Mya, just after the start of the “Cambrian explosion”. With certain assumptions, it is possible to show that eyes could develop quickly enough that, in tandem with size increase due to enhanced oxygen content in the air, predators developed. So the eye may have been the match which lighted the Cambrian explosion.8Lane (2010), 185. 1. ↑ Could they also be the basis of metaphor? 2. ↑ This can be likened to the Control Data Corporation supercomputers of the 70s (which I knew well), which had one central processor for mathematical and logical calculation, and a number (on the order of 10) of smaller, independent so-called peripheral processor units which handled input-output and storage devices. 3. ↑ Such logic can only be described by the French word tordu, twisted. Anyway, you don’t have to remember this. If you insist, though, it goes like this: Light on means the receptor emits less glutamate, which hyperpolarizes (turns off) the OFF cells and depolarizes (turns on) the ON cells. Light off means the receptor emits more glutamate which which depolarizes (turns on) OFF cells but hyperpolarizes (turns off) ON cells. Sheesh. 4. ↑ I find the functioning of retinal cells is as genial as some of the other marvels of the scientific world, like the electron transport chain. 5. ↑ A substance which binds to a receptor. 6. ↑ Hence, the importance of vitamin A for vision. 7. ↑ Lane (2010), 199. 8. ↑ Lane (2010), 185. The forebrain is composed of the telencephalon and the diencephalon. It handles everything which makes us “us” – or at least gives us that impression – including perceptions, consciousness, cognition and voluntary action. The figure below recalls the parts of the brain in development. The telencephalon develops into the cerebrum, the largest part of the human brain, which consists of the cerebral cortex and several elements below it such as the hippocampus, the basal ganglia (or, more correctly but less historical, basal nuclei) and the olfactory bulb. The cerebral cortex is essential for all sorts of processing of sense data and motor control. It is where the reasoning and cognition specific to humans (and, to a lesser degree, some other animals) takes place, and is the seat of planning and language, volitional behavior and conscious perceptions, thinking and memory. It is the command center where input sensory information is translated into output motor control. In evolutionary terms, it is the most recently developed part of our brains and has taken over or added to function of older structures. Its unique and fairly uniform structure (sometimes termed “canonical”) allows for great plasticity in functioning. It consists of layers1Six, in the striate cortex. of gray matter (neuron cells, dendrites and synapses) on the outside (distally) and white matter (axons) beneath, although the difference in colors is less pronounced than those terms may imply. It consists of two lateral hemispheres joined by a bundle of axonal connections, the corpus callosum. Usually, the left hemisphere handles sensory input from and motor output to the right side of the body and vice versa. The left hemisphere handles more of language and detailed analysis than the right. The right side handles visual pattern recognition and overall perception, and seems to be important for the appreciation of music. But the brain is quite plastic (capable of changing), so any strict distinctions between the function of left brains and right brains must be considered with some skepticism. The cortex consists of five lobes partially separated by the sulci and notches. Functions are distributed among the different lobes as follows. The frontal lobe, which is located anterior to the central sulcus and above the lateral fissure, is the site of planning and takes into account goals and environment. It is important for movement, as it includes the primary motor cortex. It is also part of the neural circuitry for language and working memory. The activity of this lobe goes from more abstract to more specific (motor) from front to back. The frontal lobe includes a motor map (explained later). The parietal lobe, posterior to the central sulcus and above the lateral fissures, receives skin data – touch and pressure – which are mapped here. It also assembles information from other senses, like space around the body, and decides where to direct attention. 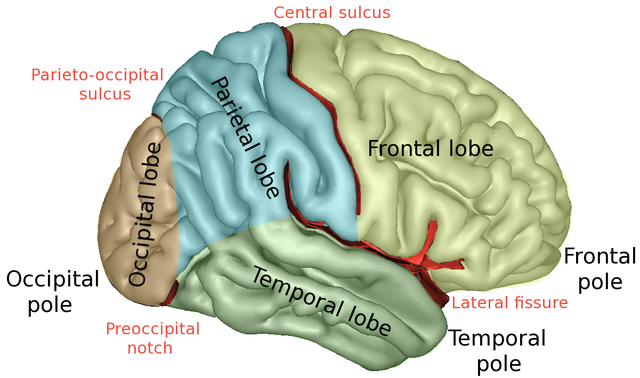 The temporal lobes, on the sides below the lateral sulci, handle auditory processing and visual interpretation, do pattern recognition and are essential to language comprehension and speech. The occipital lobe, at the back, contains the visual areas (V1, V2, …) which analyze aspects of sight, such as color, depth and motion. There is a retinotopic map on V1 (explained later). The lateral prefrontal cortex is essential to rationality and planning. It contains short-term memory such as working memory. This is transferred to long-term memory through the hippocampus during REM (rapid eye movement) sleep. The cingulate cortex is an evolutionarily older cortex below the neocortex and is part of the mesocortex. It connects the limbic system and the neocortex. Its forward (“ventral”) part, the anterior cingulate cortex, which contains the anterior cingulate gyrus, is important in control by the neocortex, telling it when things are not going according to plan. The primary motor cortex controls voluntary movements by means of axons which run down the spinal column and connect to motor neurons at the neuromuscular junction, as we have seen in a preceding chapter. These structures lie below the cortex. The hippocampus receives input from sensory areas and from the rest of the neocortex and, along with other structures deep within the temporal lobes, such as the rhinal cortex, is essential for conversion of short-term to long-term memory. It has connections to and from almost all the neocortex. By projecting the connections it receives back to the neocortex, it activates the same regions which were originally activated by the senses and so forms a mental representation of the sensory perception. The amygdala has a function similar to that of the hippocampus but concerns events of high emotional content, such as moments of fear. Such memory provides for fast, low-resolution, autonomic responses to recognized stimuli, such as odors or the need for flight from dangerous situations. The amygdala works with the orbitofrontal cortex (OFC) to assess risks and rewards and to choose appropriate behavior and remember it. These memories are our emotions and may give rise to what we call intuition. Although the amygdala and hippocampus perform similar functions, they have different inputs and outputs. The basal nuclei (formerly called basal ganglia) are hidden deep under the cortex, basal meaning deep within the brain. They are important in planning and executing motor movements initiated by the neocortex. They consist of the caudate, putamen, globus palladus, substantia nigra and subthalamic nucleus. The caudate and putamen together constitute the striatum. The diencephalon lies beneath the neocortex and consists of the thalamus and hypothalamus and parts of the so-called limbic system. The thalamus is an extremely important double structure which is the gateway for sense data (except olfactory) as well as signals from the rest of the nervous system; it relays the information to appropriate areas of the neocortex. The hypothalamus controls the autonomic nervous system. It assures homeostasis by producing hormones which regulate essential functions (temperature, blood pressure, hunger, thirst, circadian rhythm, etc.). As has been discussed already, it is the brain’s gateway to the endocrine system via the pituitary gland, the posterior pituitary being an extension of the hypothalamus. The hormones it secretes include oxytocin, which is released by the posterior pituitary gland and plays a role in caring and childbirth, and vasopressin, which regulates water retention and may also play a role in social behavior and bonding. The limbic system is an evolutionarily old set of structures which existed before mammals. The term limbic system is historical and does not refer to an integrated structure, so it is often denigrated. It is subcortical (lies beneath the cortex) and is considered to be constituted by a number of structures, including the thalamus, hypothalamus, cingulate gyrus, basal ganglia and the following:2The term “limbic system” is historical and its members are not all in the same embryonic structure. I am not quite certain where they should be housed according to modern standards. Nuclei (groups of cell bodies) in the mid- and hindbrain play a role in essential, non-cognitive functions such as respiration, blood circulation and level of consciousness. They are phylogenetically very old and exist in all vertebrates. The midbrain, or mesencephalon, includes the following structures. The substantia nigra (also considered one of the basal ganglia) is involved in the initiation and maintenance of voluntary movements. Damage to it is linked with Parkinson’s disease. 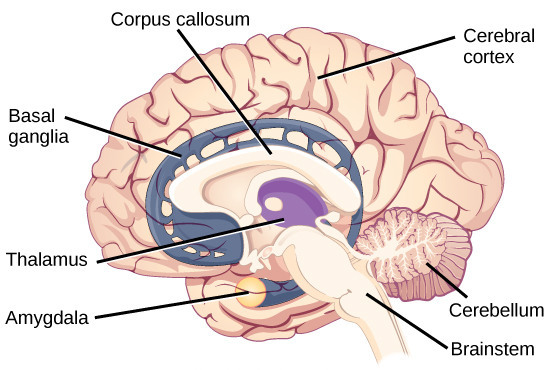 The inferior colliculus receives audial information and relays it to the thalamus. 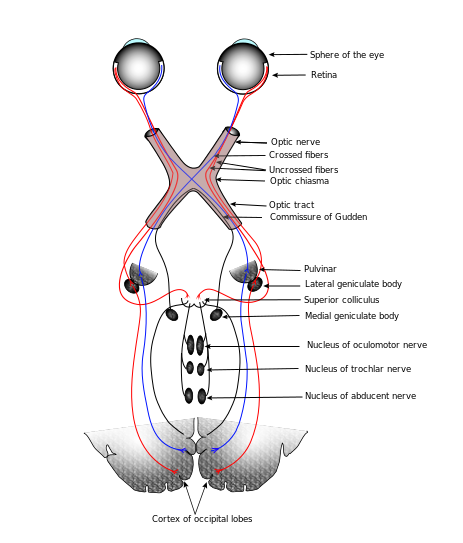 The superior colliculus receives visual information from the eye and, in turn, controls eye movements (saccades). It holds maps of the visual world. The superior and inferior colliculi together form the tectum, the top of the midbrain. The reticular formation runs from the midbrain into the spinal cord. It has a number of different modulatory functions, including control and regulation of the brain’s state of arousal and consciousness. The diffuse modulatory system consists of the locus coeruleus, raphe nuclei, substantia nigra and ventral tegmental areas. These cells perform regulatory functions as each of them sends small amounts of a specific neurotransmitter across wide areas of the brain or spinal cord. They can be thought of as a kind of volume control. The hindbrain, or rhombencephalon, supports vital processes. The medulla is a communication path for axons between the brain and spinal cord and is the place where axons to or from the rest of the body change sides (decussation). It controls automatic functions such as breathing, heartbeat, hearing, touch, taste and swallowing. The pons is anterior to the medulla and handles visceral functions and facial expressions. It contains centers like the vestibular nuclei, which receive information about orientation of the body relative to gravity and acceleration, so it is partly responsible for balance. As its name implies, it forms a bridge between the cerebral cortex and the cerebellum. The cerebellum (“little brain”) is the most complicated part of the hindbrain. It consists of two lobes at the back of the brainstem. In terms of size, it is second after the cerebral hemispheres. It receives input about the body from the spinal column and about goals of movements from the cortex and coordinates the two. It also memorizes information needed for complex motor skills. Unlike the cerebral cortex, each side controls its own side of the body. Without the cerebellum to modulate and coordinate motor behavior, you would not be able to ride a bicycle – or walk. The cerebellum is the oldest part of the brain from an evolutionary point of view and is necessary to all animals, at least to vertebrates. The spinal cord manages basic life-critical functions such as reflexes, breathing or heart rate; its actions are usually unconscious. As already explained, the spinal cord is segmented, each segment having two pairs of ‘roots’ connecting the spinal cord to other parts of the body. The ventral roots are outgoing (efferent) motor-neuron axons, clustered in functionally related groups. Their cell bodies are within the spinal cord. The dorsal roots are the incoming (afferent) sensory-neuron axons. Their cell bodies are in dorsal root ganglia, near the spinal cord. Interneurons may connect the incoming and outgoing circuits so as to allow rapid reflex reactions, like the knee jerk. They also relay commands coming from the brain. Now go on to study brain inputs — the sensory systems, maps and vision. 1. ↑ Six, in the striate cortex. 2. ↑ The term “limbic system” is historical and its members are not all in the same embryonic structure. I am not quite certain where they should be housed according to modern standards. The human brain weighs about 1.5 kg and contains on the order of 100 billion (1011) neurons, each with an average of perhaps a thousand connections. The brain also includes the retinas of the eyes and extends down to the spinal column. It consists of an inner and evolutionarily older part which is covered over by the cortex (or neocortex, if you consider the older part as the mesocortex). The neocortex is about 2500 cm2 (50 cm on a side) if spread out, but is compressed like a wadded-up piece paper so it contains creases called sulci (singular, sulcus) and bumps called gyri (singular, gyrus). Over the last two million years of evolution, the size of the hominid brain has almost tripled. The brain has not just grown, it has changed its form. There are no direct fossil records of brains, only skeletal craniums which may indicate brain size and, sometimes, the shape of the cortex. It seems that as hominid brains increased in size, the cortex grew relatively larger and was reorganized in a way that facilitates emerging cognitive abilities, e.g., language. All this is the subject of paleoneurology, a whole domain in itself and beyond the scope of our considerations. Following in the footsteps of geologists and biologists who learn about the past by studying the present, we can deduce Information about evolution by comparing the brains of different contemporary animals. The less-developed brains of animals like lizards possess only some of the components found in mammal brains. In particular, the neocortex which covers all the rest of the mammal brain is non-existent or much more rudimentary in “lower” animals such as reptiles. Hence, the lower part of the human brain has been called the “reptile brain”. That is not to say it does not have essential functions, because it certainly does. The brain contains a fairly large number of functional elements. Today, brain structures are grouped according to embryonic development of the brain, as already presented on the page about developmental biology. This has not always been the case; terms like “limbic system” remain in use, sometimes leading to confusion. The following figure recalls the developmental parts of the brain. Neurons are cells and so share the properties of cells, including membrane potentials and organelles, discussed in preceding chapters. A neuron possesses a cell body and various organelles, including a nucleus and mitochondria, like almost any other eukaryotic cell. 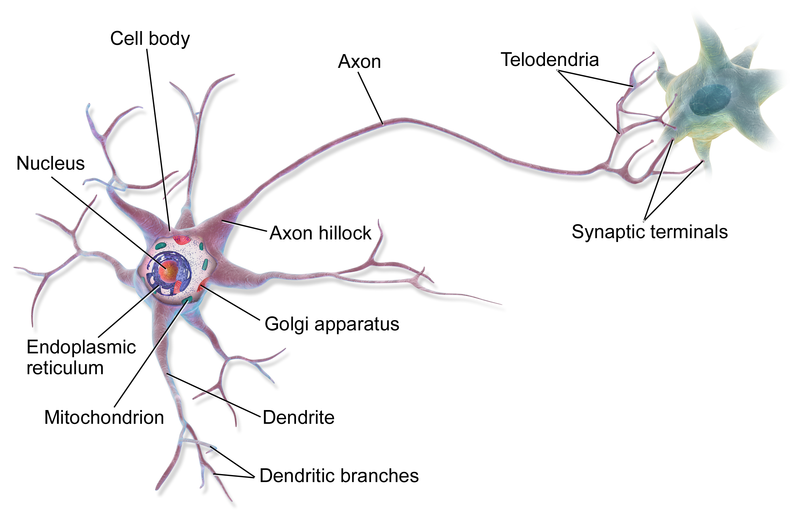 In addition, a neuron possesses a “tree” of input branches called dendrites and generally one long output branch called an axon, usually terminating in a number of smaller axon branches. Dendrites and axons together are referred to as neurites. Chemical signals called neurotransmitters are passed from the axon terminal of one neuron across the gap, called a synapse, separating it from another neuron’s dendrite terminal. 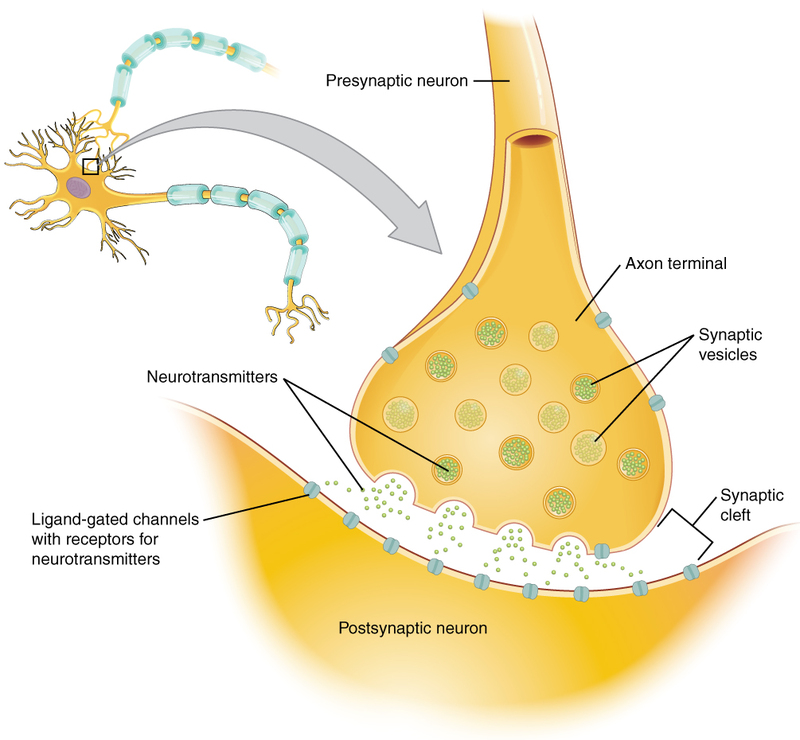 If the second neuron receives a sufficiently great chemical signal, an action potential is created (as explained previously) which passes down through the cell’s axon and out to the synapse to another neuron, where a chemical signal again is released. This process is then repeated. Through multiple dendrite and axon terminals, one neuron can communicate with many others to form a network. This is basis of neuronal function. Neuroscientists classify neurons in different ways. The simplest distinction simply classes neurons by their number of neurites: unipolar, if one; bipolar, if two; multipolar, if more than two, like the above. 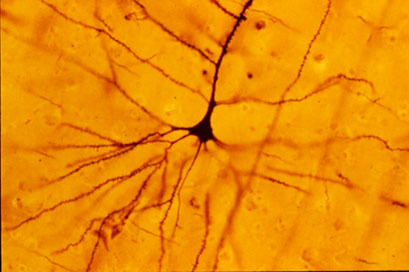 In the cerebral cortex, the two principle types of neurons, as defined by the structure of their neurite trees, are pyramidal (triangular) cells, with one principal neurite running toward the outer and one toward the inner side of the cortex, and stellate cells, with many projecting neurites. Dendrites may be spiny (complicated) or not (aspinous). Neurons may be projection neurons (Golgi type I), projecting to farther parts of the brain, or local circuit neurons (Golgi type II), sticking around home. Pyramidal cells tend to have long dendritic trees and so are projection neurons. Neurons are also classified according to the neurotransmitter they use. For instance, cholinergic neurons use the neurotransmitter acetylcholine. electric potential on voltage-dependent sodium channels (leading to depolarization of the cell). Some neurons transmit output to the motor system, where different axon terminals activate sets of muscle fibers called motor units. In neurons, a signal is generated when a neurotransmitter molecule stimulates a ligand-gated channel specific to that neurotransmitter. The neurotransmitter may be excitatory or inhibitory. An excitatory neurotransmitter contributes to forming an action potential by depolarizing the cell, as already described. An inhibitory neurotransmitter opens either a Cl- or a K+ channel. Either Cl- flowing into the cell or K+ flowing out reduces the membrane potential, which is said to be hyperpolarized, thereby reducing the probability of forming an action potential. Receptors are also of two types according to their functioning. Receptors such as the ligand-gated ion channels we have seen which let an ion pass through a pore in the same protein as the receptor are called ionotropic. Some receptors do not open a pore or allow an ion to pass. Instead, when the neurotransmitter, called the first messenger, binds to the extracellular side of the receptor, the intracellular side causes a G protein to activate an effector protein. The effector, which is an enzyme, causes generation of a molecule called a second messenger. The second messenger may bring about other events, often multiple or cascading. Such receptors are called metabotropic. An example of a second messenger is cAMP, which we met in discussion of the lac operon, and which is generated by the effector adenylyl cyclase. If the net result is excitatory, an action potential flows down the neuron and along the axon, the output branch. Long axons are usually wrapped in a myelin sheath, which allows the signal to travel much faster than without it. There are breaks in the sheath called nodes of Ranvier where voltage-gated channels are activated to regenerate the action potential, acting as amplifiers of the action potential. Since the action potential jumps from node to node rapidly, this is called saltatory (jumping) conduction. On arriving at the end of the axon terminal, the action potential activates a voltage-gated channel which allows Ca++ to enter the terminal. These ions cause vesicles containing the appropriate neurotransmitter to fuse with the cell walls and release the neurotransmitter across the post-synaptic cleft and onto the postsynaptic receptor on a dendrite of another neuron. There, the process may start all over again. Voltage-gated channels in the pre-synaptic terminal allow entry of Ca++, which induce release of a chemical neurotransmitter. 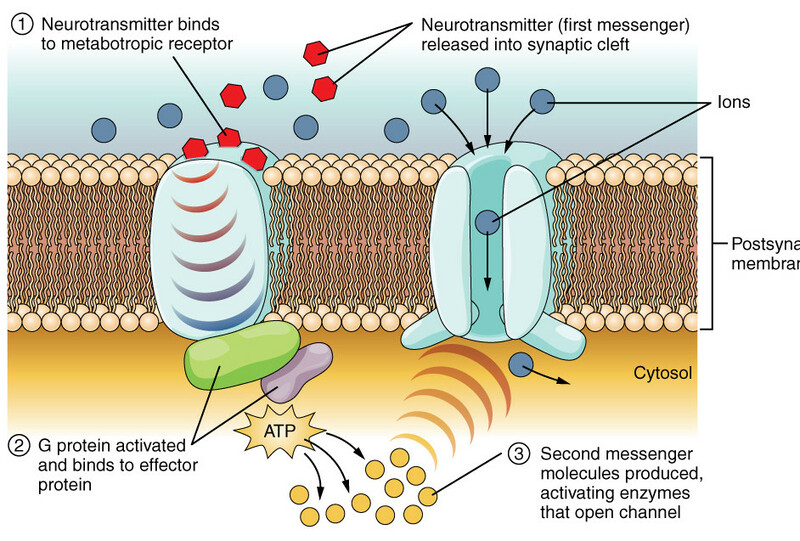 On arriving at the post-synaptic terminal, the neurotransmitter opens a ligand-gated channel which may induce an electrical action potential. So a pre-synaptic electric signal has been linked to a chemical signal which is converted back into an electric signal in the post-synaptic terminal. Electricity to chemistry and back to electricity. In this way, electrochemical signals are propagated from one neuron to another or others, setting up “currents” of communication in the nervous system. These currents or circuits are the basis of what goes on in the brain – reflexes, emotions, thoughts, planning – the whole shebang. As already stated, there are about 100 billion neurons in the brain with an average of 1000 or so synapses each, impressive numbers. But there are something like ten times that many other cells, called glial cells or glia. Glia are essential for the proper functioning of the neurons. Glia come in six types. The following four are found in the central nervous system (CNS). Star-shaped astrocytes form a support system for neurons. They maintain chemical concentrations and are part of the blood-brain barrier (BBB), which uses active-transport mechanisms to limit what molecules can pass from the blood into the CNS. They allow in glucose and amino acids, for instance, but deny passage to many other things, which can be a problem for administering medications to the brain. Oligodendrites (with few branches, “oligo” meaning “few”) have processes1Projections of tissue. which surround axons with myelin sheaths. Microglia act as macrophages, surrounding and digesting damaged cells or pathogens. They function as the immune system of the brain. Ependymal cells line the ventricles of the brain and filter blood to provide cerebrospinal fluid (CSF), which circulates throughout the CNS. Two other types of glia are found in the peripheral nervous system (PNS). Satellite cells surround cell bodies in ganglia and provide support similarly to that of astrocytes in the CNS. 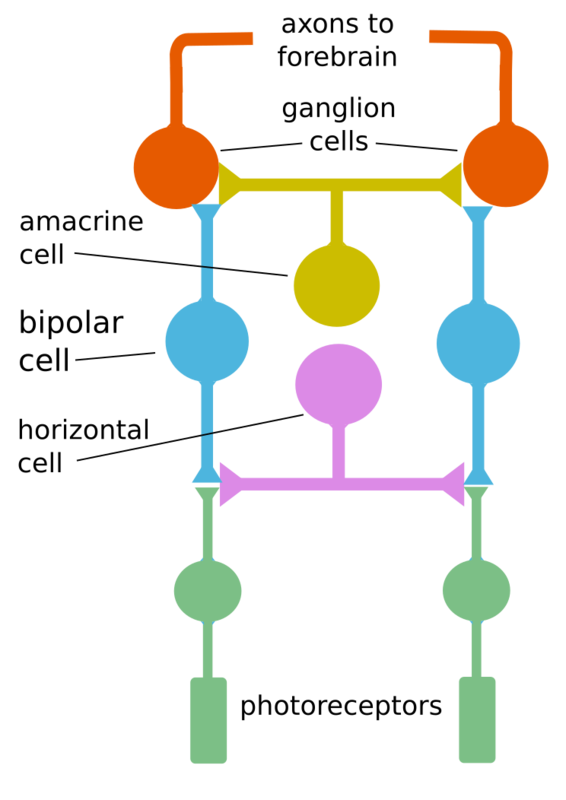 Schwann cells are similar to oligodendrites, providing myelin sheaths for axons, but one Schwann cell surrounds only one axon and dos not have multiple processes. Now let’s go on to look at brain growth and development. 1. ↑ Projections of tissue. Let us look particularly at development of the neural circuits in the neocortex. This proceeds through a number of steps. Formation of the brain’s neurons and glia takes place in the tissue of the telencephalon, specifically, in the vesicle walls. Neural stem cells in the ventricular (inner) zone proliferate by splitting via mitosis into two cells. At first, both daughter cells remain in the ventricular zone, populating the zone with neural stem cells. As the population goes up, the daughter cells more distant from the ventricular surface migrate upwards to populate the cortex. In this way, the neurons and glia of the cortex are formed from neural stem cells. In humans, most of this cell duplication occurs between the fifth week and the fifth month of pregnancy. As an example, consider the six-layer striate cortex.1Also known as V1, the primary visual cortex, in the occipital lobe. First, radial glial cells extend processes toward the marginal zone; these will serve as “tracks” which migrating cells can follow. The young neurons, or neuroblasts, resemble ordinary cells, and do not yet possess neurites. About two thirds of them follow the radial glial cells upward towards the outer surface of the brain. The first to migrate form a subplate and begin to differentiate into neurons. The next neuroblasts pass through the subplate and arrive in the cortical plate where they start to differentiate in turn. In the case of the striate cortex, they will form layer VI2That’s a Roman numeral “6”, not “Vee one”., the innermost layer. The next neuroblasts pass by the Layer VI and start to form Layer V. This continues, with one layer being formed after another until all six cortical layers have been formed – in reverse order, or “inside-out”. After all six layers are formed, the subplate disappears and the radial glial cells withdraw the radial processes. 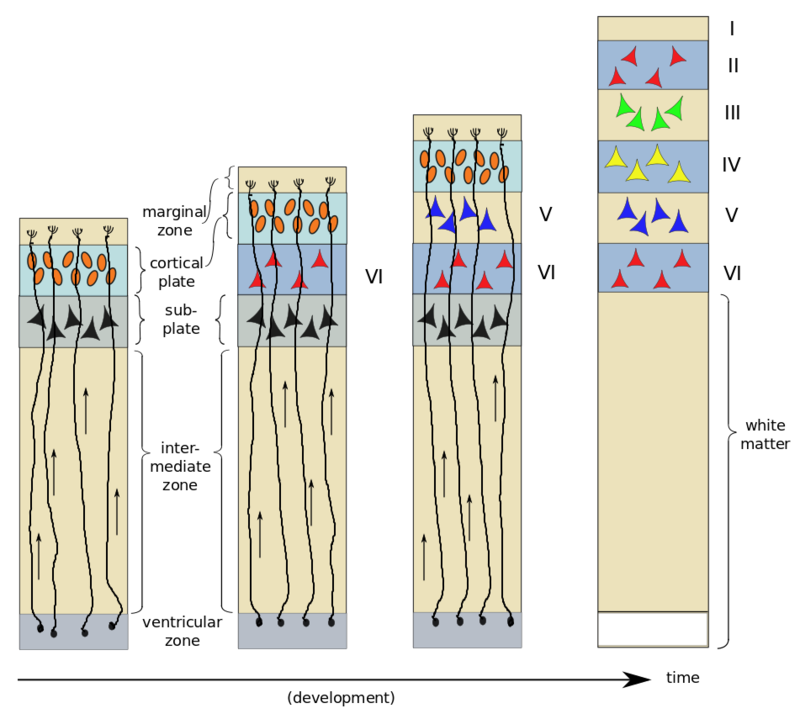 Neurogenesis and development of six layers of the striate cortex, by author, after Bear et al. On arrival in their respective layers, the neuroblasts differentiate into pyramidal cells first. Afterwards, differentiation of glial cells takes place – first astrocytes and then oligodendrocytes. It has been found that neuroblasts already know what type of neuron they will become before arriving in their appropriate layer. A protein excreted in the marginal zone serves to attract pyramidal-cell dendrites but repel their axons, making them grow perpendicular to the surface and span several layers of cortex. This laminar structuring of the cortex in horizontal layers formed by radial motion of neuroblasts explains the concept beloved of many neuroscientists of structures called cortical columns or minicolumns. This idea is based on the finding that discrete surface areas of cortex seem to communicate much more locally, using a leap-frog style of communication to contact more distant areas.3Rather like the Internet’s Domain Name System. Each such surface area is supposed to correspond to a column of cortical layers beneath it. Related to this is the concept that the cortex has pretty much the same cytoarchitecture everywhere, explaining its plasticity, wherein an area no longer needed for one function can be recruited for another. However, the utility of this concept has been much questioned in recent years, so its fate is not yet clear.4See for instance “A brief biography of the cortical column”, or “The minicolumn hypothesis in neuroscience”. The other third of the neuroblasts, rather than migrating strictly outwards along the radial glial guides, move sideways also. Most of the input from many parts of the body to the brain comes through the thalamus, which acts as dispatcher, so there are many thalamic inputs to the cortex. It seems that it is the subplate which attracts thalamic neurons to appropriate layers of cortex and thereby establishes which type of sensory input will be handled by that part of the cortex.5See Bear, 697. This process and what it has to do with the non-radially migrating neurons is not clear to me. Synapse formation and wiring (“la connectique”)6I couldn’t help using the french term here, as it is so simple. Growing neurites, which can be quite long and travel far in the body, advance as the growth cone at the tip of each one extends filopodia to drag it along an extracellular matrix of fibrous proteins. The axons tend to grow in groups of neurites stuck together7“Axons which stick together grow together”?, each group dragged along step-by-step by one axon called the pioneer axon. The growth cone is attracted or repelled by various chemical substances already released during embyronic development. The concentration gradients of such chemicals guide the axons to their destinations. Further detail on connections is furnished by molecular surface markers on target cells; these markers are recognized by specific growing axons. This method of connecting neurons is as remarkable as it is necessary. There are not enough coding genes in the human genome to specify all the connections of the 10 billion cells in our brains. What is specified are the functions – chemicals, markers and growth factors – which lead to such formation and connections. In muscles, when the growth cone finally reaches its target, a neuro-muscular junction, a synapse is formed as follows. The growth cone secretes a protein which binds to a post-synaptic receptor. The receptor then does two things. It sets up the post-synaptic terminal by attracting ACh receptors (in the case of the NMJ) to the area. At the same time, it secretes Ca++ which acts on the pre-synaptic terminal in two ways, causing it to emit neurotransmitters and inducing modifications so that it takes on the form of a pre-synaptic terminal. In the CNS, similar processes occur, but the steps are taken in a different order and different molecules are involved. Dendritic filopodia constantly reach out and around. When one comes into contact with a passing axon, pre-synaptic and post-synaptic terminals are installed and a synapse is formed. Growing in this way, the nervous system comes to contain far too many neurons and, especially, connections. Neurons depend on limited amounts of substances called neurotrophic factors, which are furnished by target cells. It seems that cells are pre-programmed to commit apoptosis unless they are prevented from doing so by neurotrophins. Since there are not enough such resources available to maintain them all, pruning takes place, as some cells are left to commit suicide. Some neuroscientists see this as an evolutionary struggle for survival among neurons. Up through adolescence, axonal connections are rearranged, synapses used more develop and those used less disappear. This is one form of neuronal plasticity. The strengthening of synapses will be considered in a later paragraph on learning and memory. Go on to look at the parts of the brain. 1. ↑ Also known as V1, the primary visual cortex, in the occipital lobe. 2. ↑ That’s a Roman numeral “6”, not “Vee one”. 3. ↑ Rather like the Internet’s Domain Name System. 4. ↑ See for instance “A brief biography of the cortical column”, or “The minicolumn hypothesis in neuroscience”. 5. ↑ See Bear, 697. This process and what it has to do with the non-radially migrating neurons is not clear to me. 6. ↑ I couldn’t help using the french term here, as it is so simple. 7. ↑ “Axons which stick together grow together”? The ultimate goal of neuroscience – the science of the brain and nervous system and cognition1Cognition is “the mental action or process of requiring knowledge and understanding through thought, experience and the senses.” (Wikipedia) – is to understand the workings of the mind and of consciousness – with treatment of disease taken up along the way. Much is known, much is not. Some think the search to understand consciousness to be a fruitless quest, but we will not consider their arguments here.2Such people include linguist and political observer Noam Chomsky and the researcher quoted as saying, “If the human brain were simple enough to understand, we would be too simple to understand it”. (Quoted in Openstax Anatomy and physiology. So this chapter will be less conclusive than the others. We will look at an overview of the physical structure of the brain, the central and peripheral nervous systems, input from the sensory system and output to the motor system, how it works in terms of neuronal connections and some ideas on how memories are formed, And, of course, these subjects will again bring up our old friends – energy and communications. As a matter of fact, that is what the nervous system is all about – using energy to communicate. Neurologists distinguish two interacting parts to the human nervous system, the central and peripheral nervous systems. The central nervous system (CNS) is contained within the brain and the spinal column, and so is surrounded by bone. It is composed of the following parts, from top to bottom. The cerebrum is the largest part and at the top. Much more on it later. The cerebellum (“little brain”) is below the cerebrum and is concerned primarily with motor control. The brain stem (or brainstem) lies between the spinal cord and the rest of the brain. It is the source of ten of the twelve cranial nerves and is a passage for nerves from the sensory and to the motor systems. The spinal cord runs from the brainstem down through the vertebral column and carries connections between the central and peripheral nervous systems. 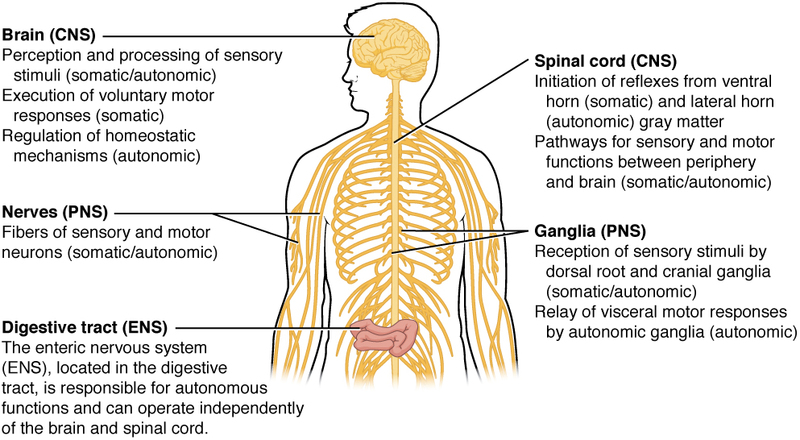 The somatic nervous system (or sensory-somatic) does conscious control, sending commands from the CNS to voluntary muscles in order to control body movements. It also receives information from the body – the skin, skeletal muscle and sense organs. The sympathetic nervous system prepares the body for immediate action, e.g., for defense (“fight or flight”), by shutting down processes that can be dispensed with temporarily, like digestion, and augmenting processes like heartbeat and blood pressure. Sympathetic NS nerves originate in the thoracic and lumbar regions of the spinal cord. The parasympathetic nervous system controls normal, resting homeostasis. It originates in the cranial nerves and the sacral region of the spinal cord. Many scientists consider a third component, the enteric nervous system, which manages digestion. The two nervous systems are articulated in or around the spinal cord, which can be considered the bridge between the two, and hence between the brain and the body’s motor system. Regions and segments of the human spinal cord, after Gray’s Anatomy via Wikimedia. 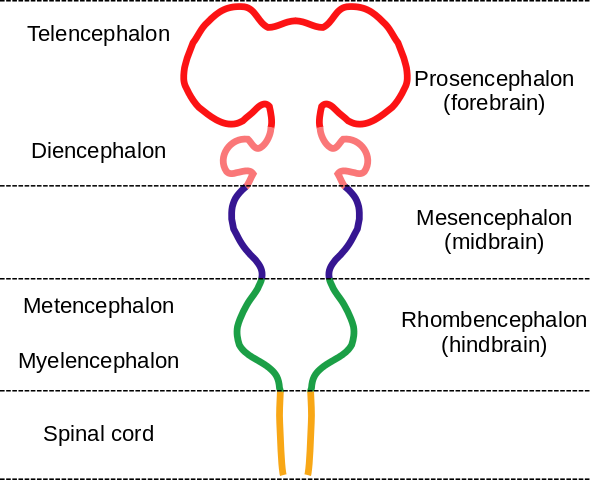 Regions are cervical (red), thoracic (blue), lumbar (yellow), sacral (green) and coxxygeal (red, at the bottom). Thirty-one pairs of spinal nerves, bundles of axons which enter or leave the spinal column at different levels, pass through notches between adjacent vertebrae. They are labeled by the region and the number of each vertebra. 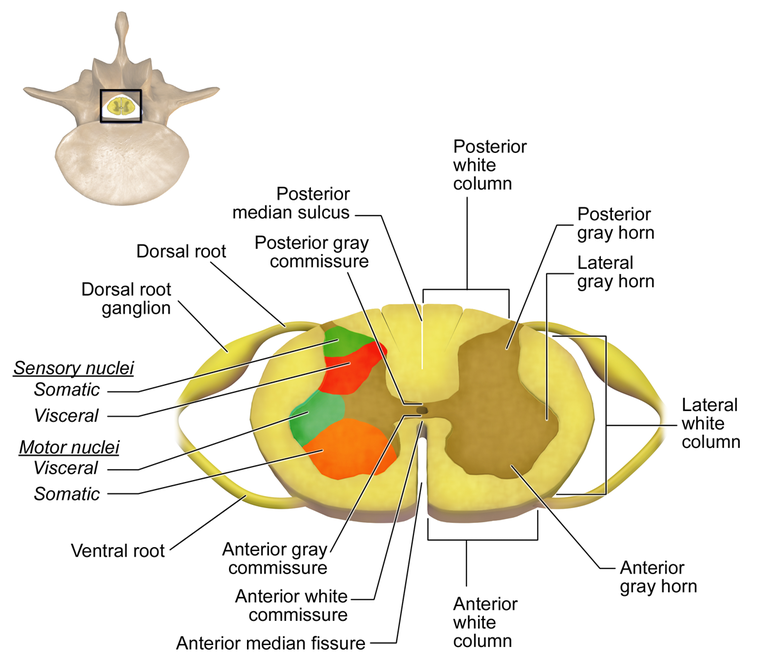 For instance, vertebrae C1 to C7 originate in the cervical region. Each one connects to parts of the body at that level or below it: The top connects to muscles and sensory receptors from the neck; the bottom, to the toes. Afferent (incoming), sensory axons enter the spinal cord by the dorsal root and their cell bodies are grouped just outside the root in ganglia, the dorsal root ganglia. Efferent axons leave by the ventral root, but once outside, share the spinal nerves with the afferent axons. Motor neuron cells have their cell bodies inside the spinal cord. In addition, there are twelve (or thirteen, according to definition) pairs of cranial nerves which emerge directly from the brain and brain stem. They are numbered by Roman numerals. Among them, the terminal, olfactory and optical nerves emerge from the cerebrum, the others from the brain stem. They are considered part of the PNS. Muscle activation spans a range from involuntary, automatic movements (e.g., blood vessel contraction or pupil dilation), through conscious, reflexive movements (withdrawal from burning objects) and on to planned, conscious movements (walking). All require that input from sensory receptors in the region concerned be coordinated with movement planning in order to adjust and refine control. Now let’s go on to look at the overall structure and evolution of the brain. 2. ↑ Such people include linguist and political observer Noam Chomsky and the researcher quoted as saying, “If the human brain were simple enough to understand, we would be too simple to understand it”. (Quoted in Openstax Anatomy and physiology.